The citizen-soldiers who fought for the Confederacy personified the best qualities of America. The tenacity with which Confederate soldiers fought demonstrated their belief in the rights guaranteed by the Constitution. Today, the SCV is preserving the history and legacy of these heroes so that future generations can understand their motives and character. What is the SCV? If you're a male descendent of anyone who honorably served the Confederate military, claim your heritage now with pride. Contact the individuals named below for membership information or visit our next meeting. Visitors are Welcome! SCV Camp #1399 has paved the area around our monument with memorial bricks engraved with the name, unit and county of Confederate Veterans. 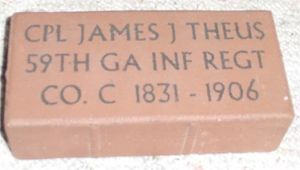 Southern Heritage supporters may purchase a brick with the name of a Confederate Veteran they choose or the Camp will nominate one for you. For more information about buying a memorial brick, go to the Memorial Brick Order Form . All proceeds go to SCV heritage preservation projects and to maintain and improve this monument to Confederate Veterans.